Ever growing resistance of pathogenic bacteria against the existing antibiotics has forced researchers to look for new methods and techniques to design effective antimicrobial agents. 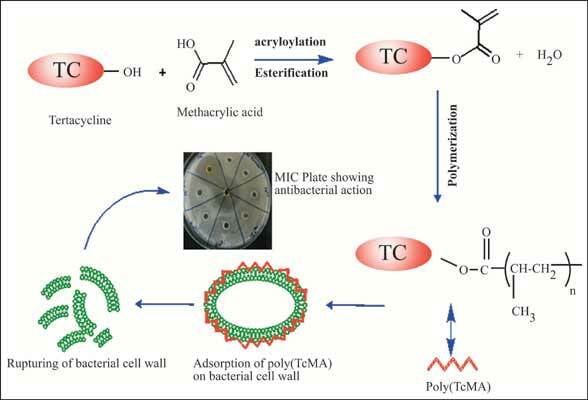 In the present study a new tetracycline-based antimicrobial polymer (AMP) was synthesized from tetracycline and methacrylic acid (MAAc) using lipase as catalyst. The AMP, thus obtained, was transformed into nanoparticles via an emulsion method. The AMP and its nano-form were characterized by FTIR, NMR, XRD, SEM and EDAX. The antibacterial activity of the AMP was studied against both resistant (-) [P. aeruginosa] and susceptible (+) [S. aureus] bacteria. The synthesized AMP, including its nanoform, was observed to be more potent and efficient antimicrobial agent than the precursor tetracycline. Acryloylation, antimicrobial polymers, lipase, resistant bacteria, tetracycline. Department of Chemistry, Himachal Pradesh University, Summer Hill, Shimla-171 005 India.